A young man called with inquiries about our farm and venue and once his questions were answered, he wanted to secure a date. At first I was skeptical. “Don’t you want to come out and see Milagro Farms first?” I asked. He didn’t. He said he had all the information he needed. “I really think you need to come take a quick tour before making a final decision,” I said. As it turns out, he had not. I became even more skeptical. Was this guy nuts to spend money on a venue without the bride’s approval? Or without a confirmed engagement? Turns out this groom wanted to ask for his girl’s hand in marriage on the site where he planned (emphasis on planned) to say “I do” to her and so would officially ask her to marry him during the initial tour of Milagro Farms. This romantic, yet risky, plan would unfold once the ring was made. And he still had several weeks to wait on the ring. But, he was sure he wanted the venue. Questions quite naturally came to mind: What if she says no? Awkward for him. What if she says yes to the guy, but does not like the venue? Awkward for me. What if…. You get the idea. But I played along excited with the romantic notion. Wait. Stop. The photos. The idea that it would be me capturing their precious moment on film sunk in. Not a good plan. My new young groom-friend told me they’d bring a good camera and he would slip it to me during the tour. Caught up in the adventure of it all, I didn’t want to throw water on his fire and inform him of my photographic ineptness. I mean, after all, there was a considerable amount of risk to the whole affair anyway. The day arrived for the tour and Quaid called to let me know they’d forgotten the camera and wanted to know if I had one on hand. This was one risky guy. Forty-five minutes later, I met the potential groom and his hopefully (prayerfully) soon-to-be fiancé. I knew the instant I saw Morgan get out of the car that she loved Quaid. This beautiful young woman exhibited kindness, grace, and looked very much in love. And Quaid, he was confident, not overly confident as are some, but one who possessed a certain gentleness that appears in a man when he is enveloped by the security of a woman’s love (there’s a lesson—or at least a song—to be flushed out here, but I’ll save that for another blog). But there was also a hint of apprehension in the air. With the pressure of getting the proposal right, both Quaid and I, I am sure, seemed distracted to the bride-to-be. But I got through the first part of the tour, showing them around our Bed and Breakfast and party patio. But I lost control in the barn. I realized she might see me scurrying about with the flutes, champagne bottle, and candles, so I squatted below the windows while running back and forth from the kitchen, carrying the sacred supplies. Scurrying in a low position is not an easy thing to do and my scurry was more like a low, slow strut and precious seconds ticked off the clock. I checked the window. They were holding hands and looking towards the woods. Things at the pergola were moving faster than things in the barn. A glass candle stick fell over and clanked the other. I gasped and checked the window. She hadn’t heard it. But now they were wandering to and fro and she looked ready to head back to the barn. I got to the barn door finally. I nodded to Quaid and he reached for her hand. I stood, awkward at the door and very much aware that she probably sensed me there…watching. But, if I had whipped out the phone and started getting shots, Morgan (my new best girl-friend) would have known what was about to come. I improvised. I took my phone, put it to my ear and faked a conversation. That’s when I realized I was too far from the pergola to get a good shot. So what did I do? I walked into the flower bed and started bending over, pulling weeds, and making my way precariously toward the pergola with the phone in my ear talking to a phantom. Are you getting the picture? I am sure Morgan was ready to bolt, thinking me crazy. Or a stalker. But Quaid dropped to one knee. I swiftly brought the phone to my eye and snapped. Darn! 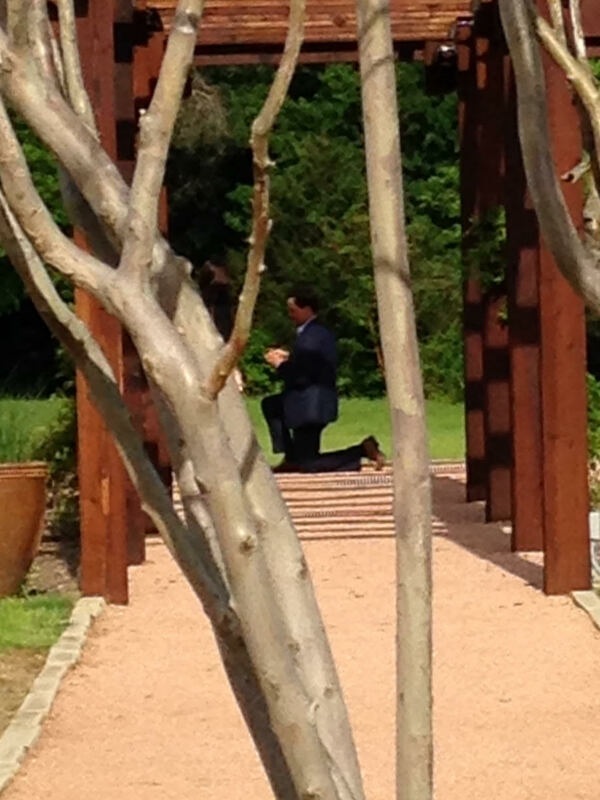 I was behind the crepe myrtle and the phone camera caught only Quaid on one knee. The tree trunk blocked Morgan completely from the shot. Laurie’s great shot of the big questions. I saw her reach both arms for him. I jumped from behind the tree and started walking toward them in a quick manner, snapping shots as fast as I could. Did I ruin the moment? You betcha. But, she said yes to her groom anyway and giggled at our less-than-perfect efforts. 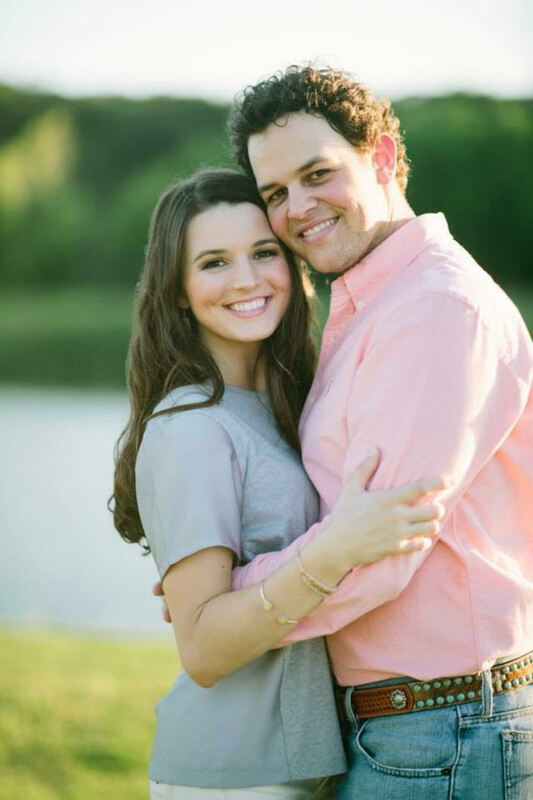 And, she said yes to having her wedding at Milagro Farms. The three of us are forever bonded. We drank the champagne together, toasting to their love and anything we could find in common. What an afternoon! It’s not every day you see a man on a knee before his beloved. John Deere tractors, Vera Wang gowns, holy moments, and laughable stories. 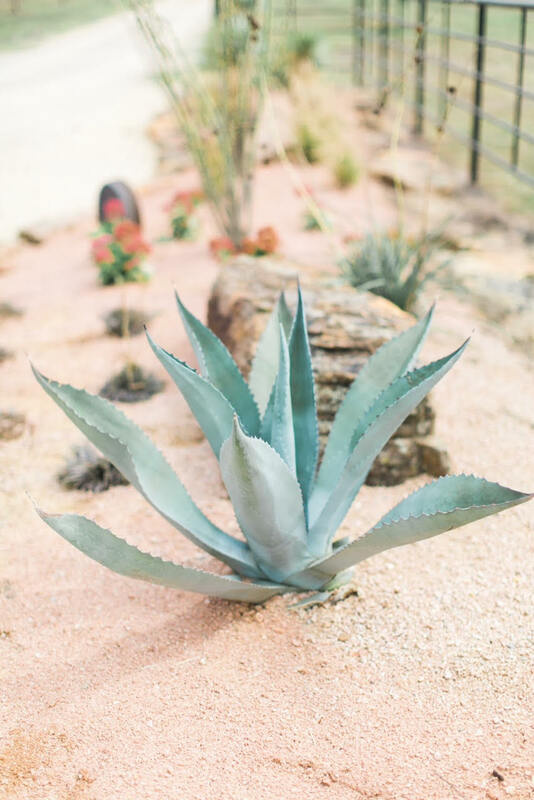 At Milagro Farms, we experience it all. Congratulations to Quaid and Morgan. I can’t wait to see what this wedding produces. I am so thankful to be here and experience these moments with all of our incredibly special brides and grooms. May your blessings be as bountiful as our peaches! Looks like a good crop this year. Oh my gosh Laurie, I am laughing so hard, and feeling a little sentimental tear beginning. I can just picture you in your conspiratorial hijinks. I hear your voice telling the story. I love it. Thanks for the lovely tale. Miss you Riva! Thank you for the fun comment! Oh Laurie!!! This was priceless!!! Would have loved to be there in the barn watching this!! You made my day with this awesome story!!! She probably won’t ask you to do the photography for the actual wedding, but she certainly will love your venue!!!! Oh my goodness. This is priceless!!! Just one more reason to choose Milagro Farms! I don’t know anyone more appropriate to facilitate a union such as this. For anyone who knows you, our marriages have been strengthened from your teachings on the sacrament of marriage and how it relates to the union union between Christ and his bride, the church. You have definately found your calling!! Idea: you know how doctors have snapshots of all the babies they have delivered? I think it would be sweet to display snapshots of all the couples who have married. Some will surely want to come back to the bed and breakfast for anniversaries, etc. how special to see a remembrance of their special day!! Love you my friend!! Thanks Lis! Love you , too and we are on the same page! We started a photo wall in the bridal loft last month! It’s so awesome and already a wall of special memories!